It’s the last day of our zoo animals on vintage postcards fun. Let’s continue our visit to the New York Zoological Park. For those who’re just joining us, this is the zoo that resulted from Fordham University’s selling the land it sits on to New York City for $1000. So far, we’ve visited elephants, brown bears, and arctic foxes, giraffes, and the hippopotamus, Indian Leopard, and Malay Tiger. 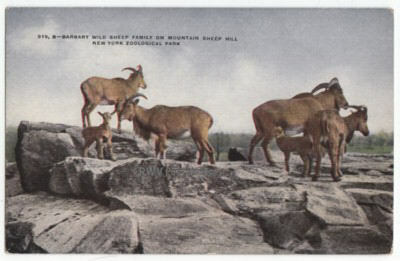 Today’s vintage postcards picture the Barbary Sheep, the Eland, and the Rocky Mountain Goat. 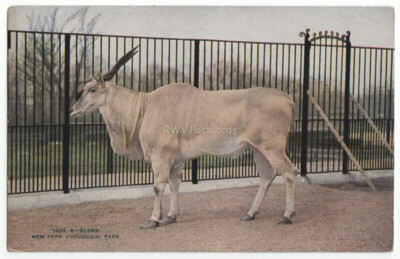 Eland are considered to be the largest of African antelopes. They have spiral horns and white, vertical stripes on their torso. Although you can’t see it in this postcard, they also have a crest of erect hair along the spine. Males weigh twice as much as females, but females have longer horns. They may be the slowest of antelopes, but are accomplished jumpers that can clear a 10′ fence from a standing position. The Barbary Sheep is the sole wild sheep of Africa. It has been impacted greatly by hunting, and livestock. The Egyptian Barbary Sheep is currently classified as extinct in the wild, but some believe they still exist in southeast and southwest Egypt. This sheep has developed an exceptional ability to remain motionless when danger threatens, thus remaining unseen to predators. The mountain goat is not threatened. They have strong forelegs that allow it to jump quickly. These goats are highly competitive, with the female being more aggressive than the male. 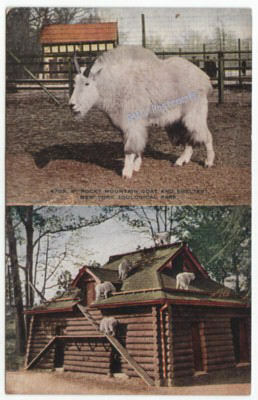 I hope you enjoyed your tour of the New York Zoological Park’s animals thru vintage postcards. This tour is an example of how vintage postcards are more than just pretty pictures and pieces of old paper. They are an adventure! ** If you liked this blog post on the New York Zoological Park, please click on the bookmark button to the lower right.